An app designed for trainee soccer players who want to share experiences and show their talent, aiming to teaming up with peers or to entering the scope of the soccer scouts. Legendstakes off around the world next Saturday, on the 11th day of month 11th, for the enjoyment of the 11 players of a team and their entire environment, as the first global grassroot soccer network. The application, for free download at App Store and Google Play, is launched in 16 countries in Europe, America, Asia and Africa. The first tests carried out with thousands of players from different countries have been a great success, proving the quick viralization of the application. 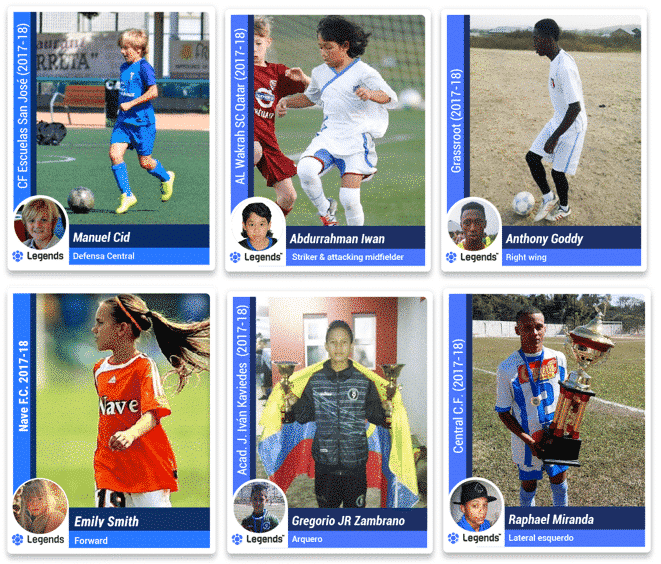 Young soccer players create their card in very few steps to start building their own “legend”. They update their statistics after each game to spread them on their favorite social network and directly interact with other app users . All games played, won, goals, assists, steals, saves… the best photos and videos of the victories of their teams. A perfect way to make known their sports career, to follow their friends’ and reference players. With no other usual interference on the most common social networks; only soccer. The card is the axis of the profile of users, who have their own wall, and works as a social network, to progressively create a community: it can give and receive support with “likes“, commenting and sharing publications, with full transparency and at any time. Statistics updated by soccer players appear on the back of the card, so it leads to commenting on games, plays, workouts, details about other teams. It is for their families and friends to follow them or, simply, to talk about soccer. Legends is an international project promoted by a group of more than 20 soccer enthusiaststhat, based in Spain, are supported by a leading business angel, the financial management of an experienced entrepreneur and the technological development of Cuatroochenta, a company specialized in the management of the reference online channel in Spain and Latin America. The project management is led by five members, whose visible heads are César Tauste (CEO), with more than 10-year experience in senior management in multinational companies specialized in technological innovation and Big Data in Europe and America, as well as José Sanz and Vicente Traver. The first objective of Legends is to create a community in the 16 countries where it is initially launched (Germany, Argentina, Brazil, Chile, Colombia, Spain, France, India, Indonesia, Italy, Mexico, Nigeria, United Kingdom, Russia, Ukraine and USA), being backed by a large network of local partners, to continue developing the app in the coming months by responding to the usage by the young players.